Yesterday was bad. I was quite depressed at the end of the day, so today was much better. I got up at my usual time, but F and his mother were up earlier. He took the day off work today and took her to see her doctor. She’s been quite sick over the last few days. I stayed here and did a few chores. I had breakfast and washed the dishes after that. I found that I’d had a mail delivery, but I didn’t have any idea the postal worker was here! I didn’t hear him if he rang the doorbell. F and his mother came back around 11:30 or so. She took some medicine and went to bed. F and I went out for our lunch after that. We had lunch today at Restaurant Futaba. We both had the quiche plate which was really fabulous. After our lunch, we went to the main post office to try and get my delivery packages. They were still on the truck driving around the city so I couldn’t have them yet. F and I bought a couple of mailing boxes though, for me to use to send to my sister. We did a little grocery shopping and then went back to the house for a while. F’s mum had lunch and then he took her out to an onsen. I stayed at the house again and did some of my internet stuff. F came back somewhere around 4 and did some work for a while. I was getting hungry around 5, but he was still doing his paperwork. He finally finished around 6. I suggested going for dinner to Kintaro Sushi, so that is what we did. It was a pretty good idea and we had a nice meal. Nama Nisshin, which is a kind of herring apparently. I love the silver! This is for two people by the way. We hit up the grocery store again for a few veggies and ended up getting a lot of things! F and I came back to the house and put away the groceries. F set up the bread maker and while he was doing that, the doorbell rang. It was the postal worker with my packages. He hadn’t heard the message where we asked that they be re-sent in the morning so he tried to deliver them on the way back to the office. Yay. We were here this time. I got two boxes, one from my sister, and one from an ornament exchange that I did with people in my women’s group. I couldn’t open the one from my sister as it has our Christmas presents in it, but I could and did open my ornament. It was lovely. 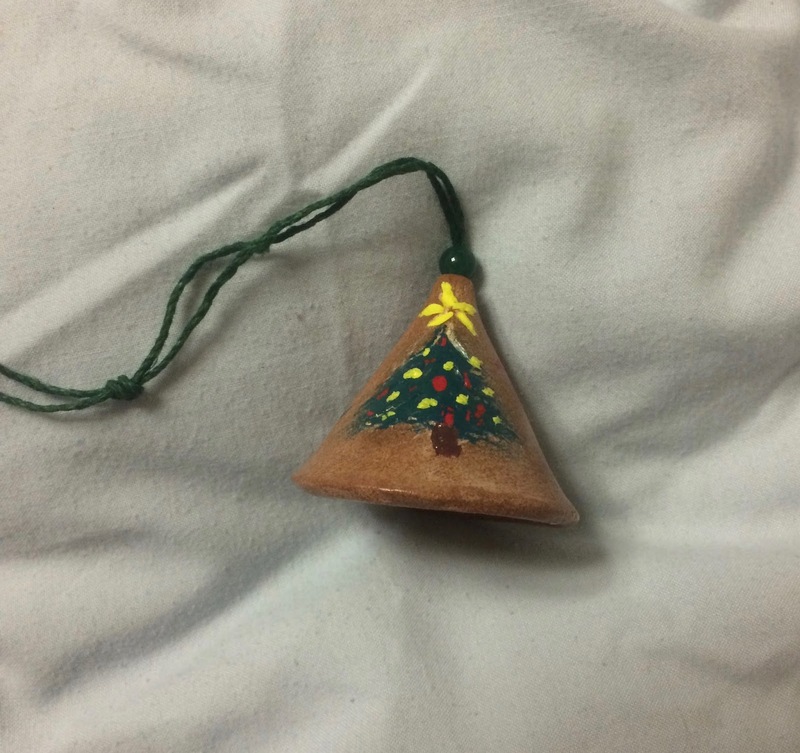 It was handmade and painted, and something that I have never had before! I got this fabulous box with snacks and a card in it. I think this is the front of the bell. The rest of the evening was fairly quiet. F and I had a few snacks and a couple of beverages. I had tea and diet coke, F had diet coke, whisky and coffee. I watched a little TV, F cut his finger again and I sent a few emails. Yay for me. That’s about it really. Tomorrow I have to do some laundry and would like to get started on wrapping my Christmas presents that I am going to send out. There’s quite a few and I need to get started on them. Come back later if you are up to it and see how my day goes. Until tomorrow….